A cork floor is eco-friendly because it comes from a sustainable source. Harvested from the bark of cork trees, a floor made of cork can be soft under foot, stay warm, and absorb sound. The warmth of a cork floor can be a problem since it can feel hot if exposed to the sun. It won't scald your feet, but it can be uncomfortable. 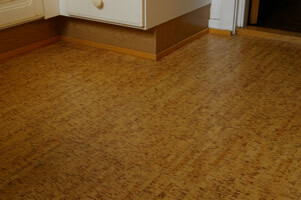 This is how a typical cork floor looks like in a kitchen setting. Floating cork flooring with an acrylic finish does not respond well to wet situations. You might want skip this material for bathrooms, kitchens, or around sliding doors and entranceways where water can enter. It's also not recommended for high traffic areas where pets and high heel shoes are used. Cork tiles are more versatile due to many coats of polyurethane. This thick finish can last a few years and will stand up better than a floating cork floor. When the finish wears down, you will need to reapply a polyurethane finish to the complete floor. Cork can be installed in many residential or commercial applications. Cork is a very soft material. Great care must be taken since one of cork's disadvantages are that it both dents and scratches very easy. Slits, however, are easily repaired. Refinishing cork is extremely difficult and limited. Although not impossible, to refinish cork flooring, it can be a strenuous task due to most brands being very thin and can disintegrate. Cork flooring is an eco friendly product that is produced sustainably. More expensive options provide color options. Most brands however look completely uniform without much variance. There is no way of making cork flooring any denser to increase dent and scratch resistance. If you are willing to sacrifice looks for a soft and eco-friendly flooring option, cork flooring might be for you.